Wildflower purple lavender flowers watercolor and vector set of 334 files. Crystal vector. 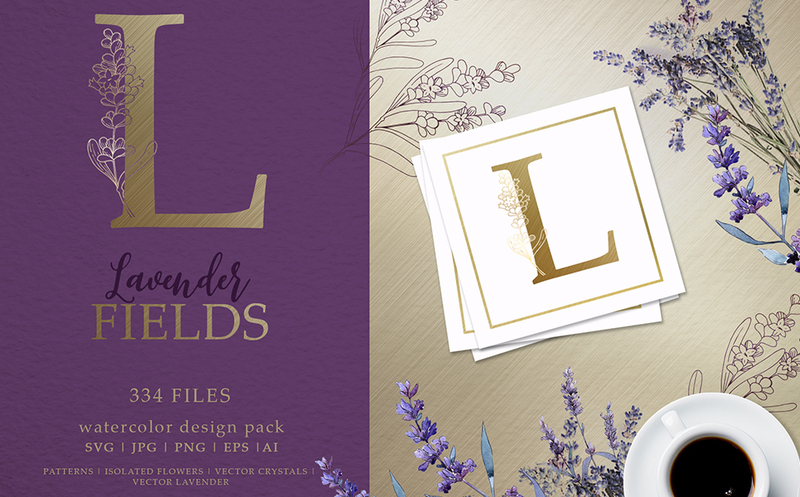 Ideal material for DIY, wedding invitations, greeting cards, quotes, blogs, posters and more.This pack contains:ai | eps | PNG | JPG | svgPATTERNS | ISOLATED FLOWERS | VECTOR CRYSTALS | VECTOR LAVENDERAll illustrations highly detailed. Aquarelle elements could be used for background, texture, pattern, frame or border. Ready to print or use for anything you want. Full editable (size, colors, etc.). The possibilities of use are endless!Elements are painted by hand and every image is a separate file. The graphics are a PNG file, 300 dpi, without background. Patterns and Frames are JPG size 3500x3500px.